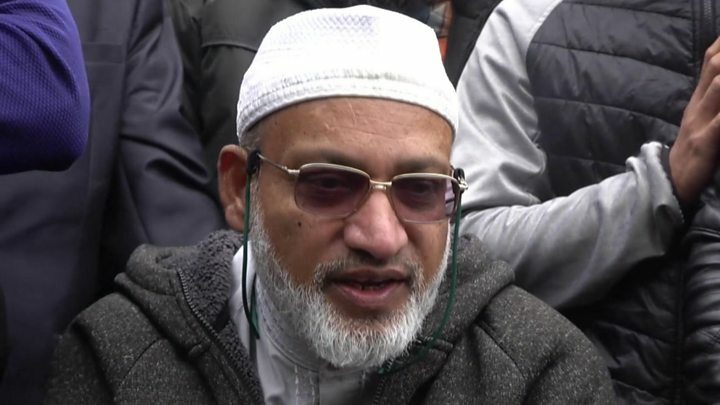 Media captionThe British man who survived the NZ mosque attack: "The best ones are not coming home"
A British survivor of the Christchurch shootings has described how he cradled the body of a young woman killed amid the gunfire. 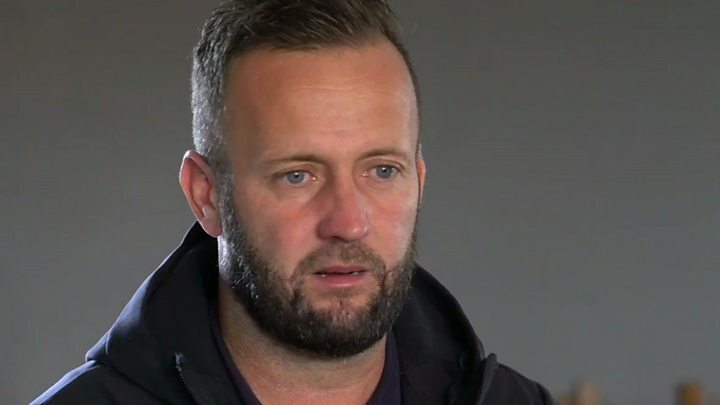 Nathan Smith, who converted to Islam after moving to New Zealand 13 years ago, found the woman after he escaped over a wall at the Al Noor mosque. The father of three, originally from Poole in Dorset, said he wants to find her husband to know that he survived. Fifty people died and dozens were hurt in the attack at two mosques on Friday. Australian Brenton Tarrant, 28, has been charged with murder. Mr Smith, who has two daughters in New Zealand and a son who lives in the UK, described how the horror unfolded. At first, he thought he heard "firecrackers" or "electrical problems" going on outside as the Imam began speaking. "Then, all of a sudden it was becoming louder and louder," he said. "The windows started going out, I could see people just falling forward. People standing up and just falling." Who were the Christchurch victims? He said those who were shot around him said "Allahu Akbar" as they fell to the ground. Mr Smith managed to escape through the back of the mosque and ran to his car - dialling the New Zealand emergency number 111. When the gunfire briefly stopped, he said one man, who often helped at the mosque, returned inside. He never came out. In the car park, Mr Smith saw survivor Farid Ahmed take shelter behind a car, but another worshipper was shot. Media captionFarid Ahmed: "I have forgiven him and I will pray for him"
When the firing started again and someone said the gunman was coming out, he escaped over a wall. "I wasn't scared there was no time (to be) it was just reaction. I just went over," he said. He found a young woman lying in the road beside the mosque. He said: "I can see she's been shot so I crouch down and try to roll her over." He added: "Now people are coming out of the Masjid (mosque) shouting and crying and people are being shot so I take my jersey off and I put it over this girl. "I didn't know her name and I don't know where she's from at the time. I'm just holding her, I don't know why but I'm stroking her back - she's already dead." He said he spent hours at a community centre in the hope of finding her husband. "I was just hoping to catch a glimpse of her husband. I need to find him. I don't know his name. I just need to know he's okay. Friends who he had come to think of as "second family" were also killed, he said. Mr Smith has hardly slept since Friday, with memories of the victims, of the smells and sounds keeping him awake. "The emotions just keep coming. You're okay for a few minutes or an hour and then it just comes back and you remember something that you didn't remember before. "Fifty people dead. And the bodies were stacked on top of each other. People just falling. The windows going out. I can't explain it. "How I got out I don't know. All my friend's dead and me not a scratch." He said he feels "proud" of how New Zealanders have responded in the wake of the horror. "People here have been good . They've looked after us," he said.